Imaginative and intriguing flick set in turn-of-the-century Vienna, where takes place a crash of wits between a famous magician , a price and and a Police Inspector . 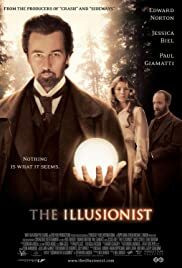 This enjoyable and fresh story about intense rivalry among an ambitious , easy-going magician named Eisenheim (Edward Norton who did many of his own magic tricks, with the coaching of James Freedman) who becomes a prestigious illusionist and get mutual envy , a Police chief (Paul Giamatti) and the heir prince (Rufus Sewel) ; being set in turn-of-the last century , Vienna (although the film is set in Austria, it was filmed mostly in the Czech Republic) . Their escalating cat and mouse feud is played out in palaces , theaters and Vienna streets . 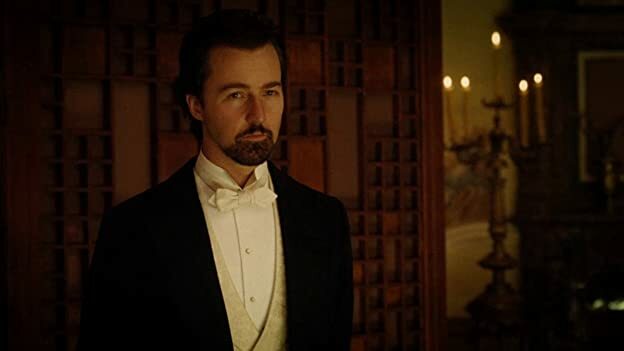 Eisenheim (his character is closely based on the magician and supposed clairvoyant Erik Jan Hanussen, who was famous in Vienna in the early part of the 20th century and was murdered by Nazi soldiers in 1933) delivers the most spectacular version of a teleportation trick that calls for something like real magic . The stage illusionist falls in love with a woman well above his social standing . He will use his abilities to secure the love of a gorgeous girl (Jessica Biel replaced Liv Tyler, who dropped out of the film just as filming was about to begin) far above his social standing as the magician use his powers to combat his enemies . The Duchess Von Teschen is soon to be wed to the Crown Prince Leopold in what would be for him a marriage solely in pursuit of power : overthrowing his father, the Emperor Leopold , as well as overtaking the Hungarian side of the empire .